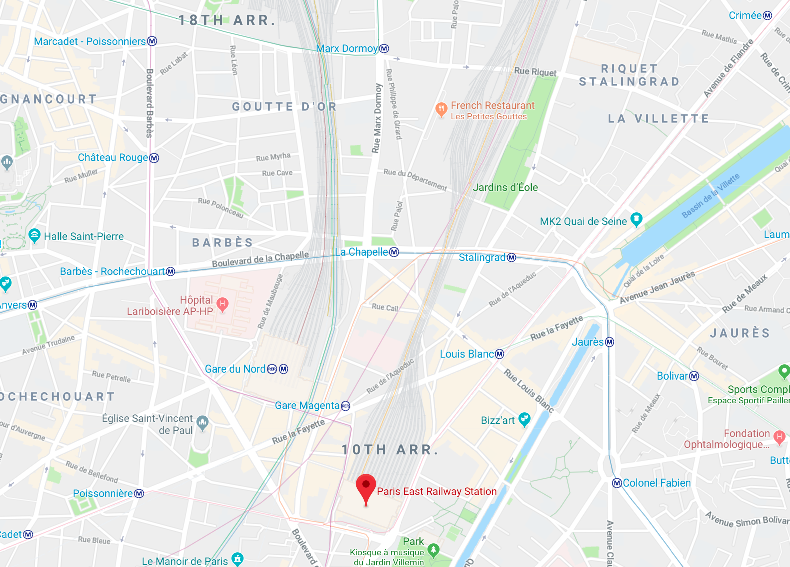 In Paris, there are two large train stations close to each other, but still separate and at a walking distance: "The (train) station of the North" - Gare du Nord, and "The (train) station of the East" - Gare de l'Est. Now, you might think maybe one of them faces North and the others faces East, so that trains don't have to make the turn, or something (I still don't see why the couldn't have two platform areas as part of the same station even in this case) - but they both face North-North-East. So what's the logic of having both these stations? I'm guessing there's some historical, rather than technical, reason for this. Also, is it fair to assume that trains travelling from/to East of Paris will always stop at Est and trains travelling from/to North of Paris will always stop at Nord? The Gare du Nord was originally the Paris terminus of the Compagnie des chemins de fer du Nord (see Wikipedia). The Gare de l'Est was originally the Paris terminus of the Compagnie du Chemin de Fer de Paris à Strasbourg, which became the Compagnie des chemins de fer de l'Est (see also Wikipedia). These companies, with others, were eventually amalgamated into the SNCF in the 1930s, but by that stage there were already two stations with different railway lines going into each. In general, trains from the Gare du Nord take the Lille line north (to e.g. Picardy, Calais, Brussels, Amsterdam, Cologne and London) and trains from the Gare de l'Est tend take the Strasbourg and Mulhouse lines east (to e.g. Strasbourg, Luxembourg, Frankfurt, Munich, Moscow). However, trains from e.g. Normandy go into Gare Saint-Lazare, and trains from the south-east go into Gare de Lyon. 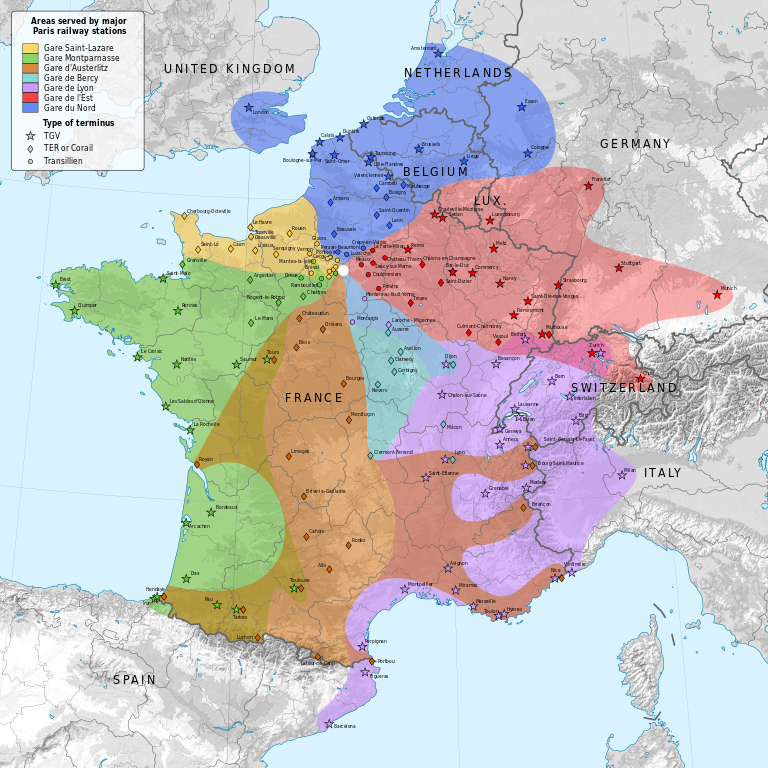 The following map shows where the lines from each of the Paris stations go. The original can be found here, by Wikimedia Commons user Sémhur. The simple answer is that the reasons are exactly the same as in London, where, in the Victorian age, different parts of the railway network were built and owned by different private companies. In the capital city, because this was the only city served by all the main lines, each network built its own main terminus station. However, it was convenient for passengers if these stations were fairly close together, so the second railway company to be founded built its station close by that of the first. Then it could advertise, as part of its service, the ease of transferring to a train on the rival network. In London, this led to the main three stations - Kings Cross, St Pancras and Euston - all being within 5 minutes walk of each other. Similarly in Paris. It must be remembered that the railways were invented by George Stephenson in England, which had the first railway network, and that other countries - France, Germany - based their systems on successful design features of the original English system. Thus it occurred for historical reasons only, in an age long before the railways passed into the ownership of the State, which didn't occur until after World War Two. If you look at the map, the two stations are separated by not much more than the width of the platforms in each station. There is a hospital dating back to 1653 between the two stations. If that hospital and other buildings had been razed they could have easily joined the two stations into one enormous station, however since the trains from Gare de l'Est all curve to the right and go East, and the trains from Gare du Nord go north it may have made more sense to keep them separate, both from the pov of retaining existing historic buildings and from the point of view of making it easy for passengers. I won’t repeat the very good answers which explain that this is for historic reasons when the two concessions were run by separate companies. there haven been several projects to connect the two stations, though this has never been achieved yet. It’s regularly revived. So the separation between the two is not as strict as it may seem. I don't know the specifics related to the situation in Paris, but as Henning mentions in comments, this is not specific to Paris. The stations might have been owned by different companies that wanted to run trains in roughly the same direction. The two train stations might have grown to being closer to each other. Note that major airports usually have more than one Terminal building. It's one airport with one set of runways, but there's multiple physical buildings with duplicating infrastructure and expensive people movers between them. The reason here is that you can cram that much people into one building, especially when it's a historic building. I guess you can view these multiple train stations as different terminals of a same station. Which are sorted by destination rather by carrier. Not the answer you're looking for? Browse other questions tagged trains paris train-stations history or ask your own question.